This year, you can have the best and most comfortable view of the Chicago Air and Water Show aboard Adeline’s Sea Moose. You and your guests will have a private, pampered viewing venue away from the millions crowding into lakefront spots to see this year’s show scheduled from Saturday, August 18 to Sunday, August 19, 10 am to 3 pm each day. For a sneak preview before the big event, major headliners usually practice on Friday, August 17. 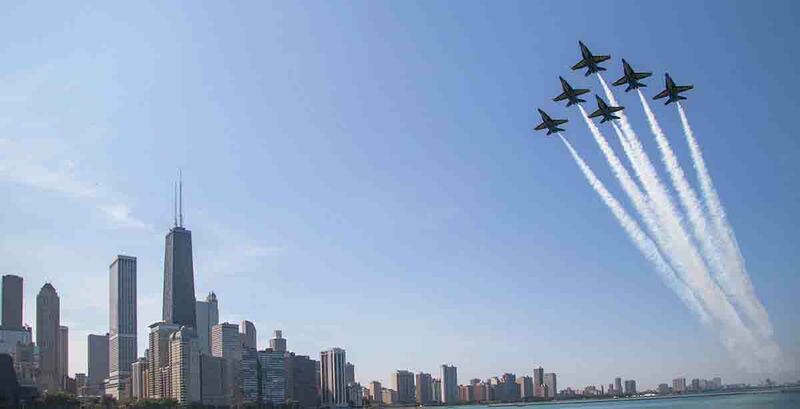 Featuring military and civilian flight aerobatics, historic aircraft, simulated water rescues and parachute teams, the Chicago Air and Water Show is one of the largest and longest-running free admission events of its kind. Featured this year will be the U.S. Air Force Thunderbirds as well as the U.S. Army Parachute Team Golden Knights and the U.S. Navy Leapfrogs.